What's new on Maine's ice cream scene this summer? Chocolate-miso-seaweed ice cream, anyone? Few summer pleasures rival a stop at Kettle Cove Creamery and Cafe in Cape Elizabeth on your way to a lazy afternoon at the beach, for a scoop of black raspberry – or how about chocolate-miso-seaweed ice cream? 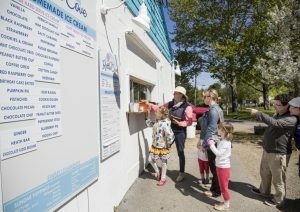 The popular Cape Elizabeth ice cream stand has a new proprietor – Mike Concannon, owner of C Salt Gourmet in Cape Elizabeth, who liked the “fun place,” and was a regular, taking his two daughters there for treats. He bought the business from high school teacher Mark Pendarvis, who’d owned the shack since 2005. Concannon has painted the building – the cartoon mermaids and seahorses swimming in a sea of green are gone. “We’ve already gotten a lot of grief over that,” he said good-naturedly (Pendarvis’ daughters had painted the artwork), but he hastened to assure fans that the mermaids will be incorporated into the cafe’s new logo. 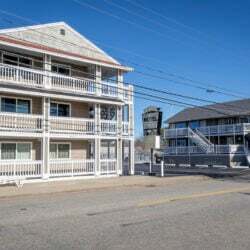 Concannon also plans to revert the cafe menu to what it used to be – classic beach food. Out with the paninis and chefs salads, in with the burgers, hot dogs, fried clams, clam cakes and french fries. Concannon is eliminating two unpopular ice cream flavors, grapenut and orange-pineapple, and adding a sundae made with blueberry pie ice cream. Every year during strawberry season, which starts in mid-June, Kettle Cove makes strawberry ice cream from fruit grown just down the road at Maxwell’s Farm. No change there – the flavor sticks around for just three weeks, though, so keep an eye on the calendar. Flavors: Summer Sunset, actually strawberry-passion fruit. Scarborough Marsh, which is chocolate ice cream with peanut butter and marshmallow fluff. 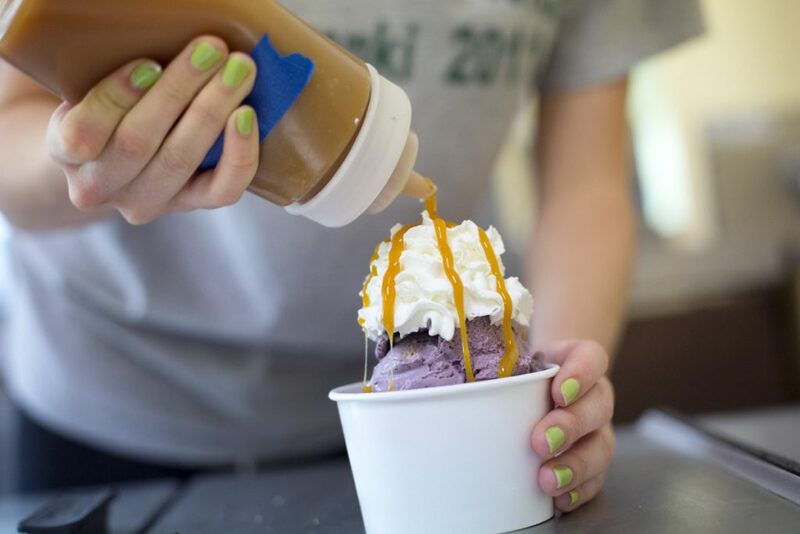 Our favorite, though, is Wiscasset Traffic, which is Maine Wild Blueberry ice cream “jammed full of things from Massachusetts,” says owner Salli Wason; the list includes Teddy peanut butter, chocolate-covered Cape Cod potato chips and marshmallow fluff. You’ll giggle all the way to the bottom of the pint. Get the scoop: 953 Congress St., Portland, or by delivery. Back story: Nothing says summer like the song stylings of the Swedish pop group, says Davis. When he was a boy, he explained, he took long summer camping trips with his aunt and uncle and cousins in the family’s 1970s motor home. 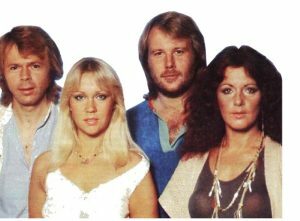 The only tape they had for the vehicle’s 8-track tape player was from ABBA, so he listened to it – over and over and over again. Now, he says, ABBA “sounds like summer to me.” Davis debuted his ABBA flavor three years ago, to coincide with the Maine State Music Theater’s production of “Mamma Mia!” It was retired to the Gelato Fiasco Flavor Vault, but when Davis heard that Abba had reunited and recorded two new songs, he decided to re-release it. Gimme! Gimme! Gimme! Look for Doughing Me, Doughing You in June and July. Flavors: A line of summer camp classics: Pink lemonade sorbet with lemon and local rhubarb. Blueberry pie with a salty oats streusel. S’mores ice cream, with a charred marshmallow base and a chocolate graham cracker ganache swirl. When can we try them? The first week of June. Get the scoop: The Farm Stand, South Portland; Rosemont Market in Yarmouth, Portland and Cape Elizabeth; Woodford Food & Beverage, Portand; and elsewhere. Flavor: Lemon curd with mascarpone. In the works: Vegan ice cream in response to growing demand. Owner Linda Parker already serves a chocolate shake made with vegan ice cream and almond milk at her Portland parlor. What will it take? For extra creaminess, “I’ve been working on making my own cashew milk,” she said. Ice Cream Wrapped in a Mystery: Each summer, owner Lauren Guptill gives several mystery ingredients to her employees, and charges them to use them to invent new flavors. Mark your calendar: During the first week in August, ten new employee flavors will go into the case, for the public to vote on their favorites. 2017 Top Two: per Guptill, that is – honey-orange ice creamchunks of orange blossom sponge cake; tahini ice cream with dates, cardamom and roasted walnuts. Get the scoop: 6 Spring St., Kennebunkpork; 259 Main St., Ogunquit; also at Bob’s Clam Hut, 315 Rt. 1, Kittery. At least two Maine ice cream companies will open new shops this year – one in our own backyard, the other not. 1. For two years, Salli Wason had been making her Rosanna’s Ice Cream in an Old Port commercial kitchen and delivering it to customers’ homes in Portland and South Portland with the help of friends and family. Now she’s opened a makeshift storefront on Congress Street in the former home of the Dogfish Company and Salty Sally’s, where customers can pick up orders, or drop by on impulse to buy a pint or two. MDI Ice Cream, 3110 Mount Pleasant NW, Washington, D.C.
A few years ago, when prices for vanilla beans were low, many farmers in tropical lands stopped growing it. At the same time, many ice cream conglomerates switched from imitation vanilla flavoring to vanilla beans in response to changing consumer tastes. 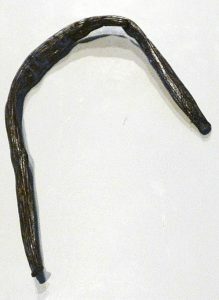 Then a cyclone hit Madagascar, home to many vanilla bean farmers. A shortage ensued, “and then the demand spiked,” says MDI Ice Cream owner Linda Parker. So did the price. The beans are so expensive that Parker announced on Facebook she might take vanilla ice cream off her menu altogether; each batch requires 10 to 15 beans. Parker’s vanilla bean bill has doubled since last year. For a pound, or roughly 100 beans, she pays $400. She’s since reconsidered and has opted instead to just make a whole lot less. To cope with the high price of beans, Gelato Fiasco is making fewer pints of vanilla to sell in grocery stores, according to Joshua Davis, a co-owner of the business. He’s not too worried, though: The company is known for its unique flavors, he said, and “we don’t need one more vanilla with Madagascar vanilla beans” on store shelves. Since he started the business in 2007, Davis has faced a sixfold increase in the price of the beans, and says a pallet now costs a whopping $12,000. Gelato Fiasco has also adjusted its recipes for other flavors, using fewer vanilla beans where it can. No patience for the long line at your local ice cream shack? Try churning your own. Get ideas, advice and recipes from “Gelato Fiasco: Recipes and Stories from America’s Best Gelato Makers,” due out in July. The 130 recipes are taken from the Gelato Fiasco shops and adapted for home use so that anyone with an ice cream maker, a freezer and a measuring cup can reproduce their favorite flavors. MDI Ice Cream has been serving “The Dude” for a long time. It’s a popular ice cream flavor based on a White Russian and named for the Jeff Bridges’ character in the 1998 film “The Big Lebowski.” Though alcohol plus ice cream is nothing new, the number of options in Maine is on the upswing. Seek out these next time you detour from Margaritaville. • Rococo Ice Cream’s Horchata Rumcake, a Latin-American-inspired flavor that uses rice milk, cinnamon and rum-soaked tres leches cake. • At Gorgeous Gelato, douse your favorite gelato flavor with a shot of liquor for a boozy affogato, an Italian dessert normally made with a shot of hot espresso. • Then there’s Gorgeous Gelato’s Maine Blueberry Dream, made with Maine Craft Distilling Blueshine (blueberry-flavored moonshine), fresh blueberries, lemon gelato and soda water. 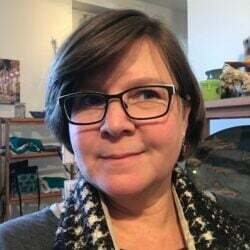 Food editor Peggy Grodinsky contributed to this story.